This tour explores the use of geodesic distances for anisotropic metric. An anisotropic metric is given through a tensfor field T which is an (n,n,2,2) array, where T(i,j,:,:) is a positive definite symmetric matrix that define the metric at pixel (i,j). Here we extract the tensor field whose main eigenvector field is alligned with the direction of the texture. This can be achieved using the structure tensor field, which remove the sign ambiguity by tensorizing the gradient, and remove noise by filtering. Load an image that contains an oscillating texture. Compute a rank-1 tensor with main eigenvector aligned in the direction orthogonal to the gradient. Smooth the field (blur each entry). Compute the eigenvector and eigenvalues of the tensor field. Display the main orientation field. 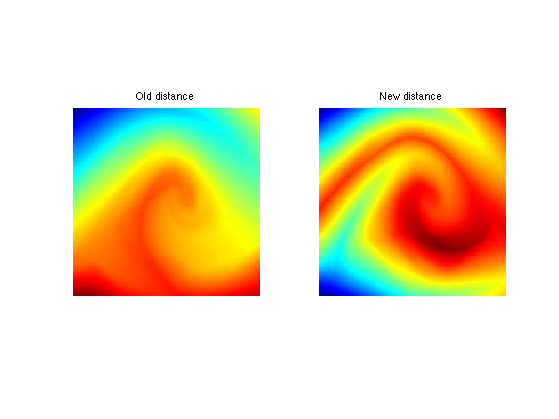 One can compute geodesic distance and geodesics using an anisotropic Fast Marching propagation. 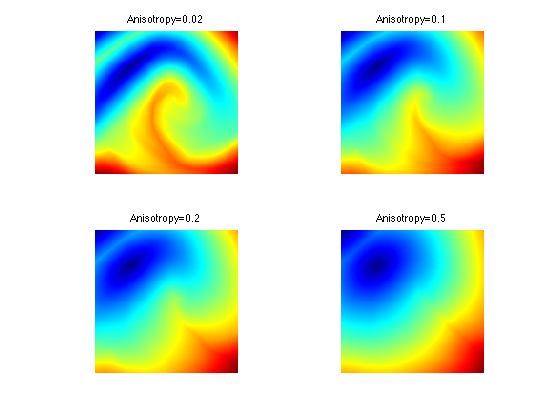 Anisotropy of the tensor field. Build the Riemannian metric using the structure tensor direction. Exercice 1: (check the solution) Compute the geodesic distance for several anisotropy, and for several starting points. 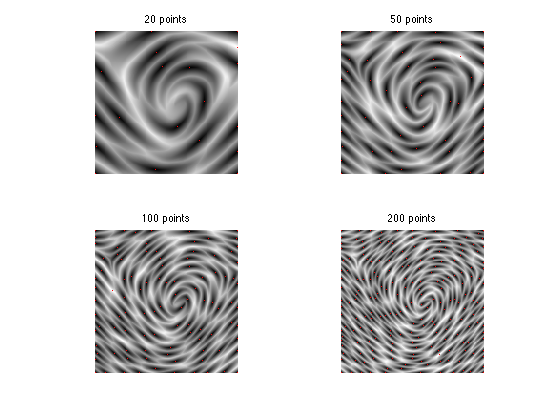 It is possible to perform an anisotropic sampling of the image using a Farthest point sampling strategy. We use a highly anisotropic metric. 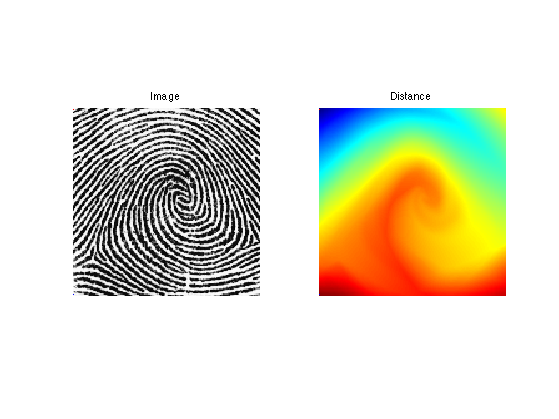 Exercice 2: (check the solution) Perform farthest point sampling. One can combine the farthest point sampling strategy with a geodesic Delaunay triangulation to perform image approximation. Exercice 3: (check the solution) Compute a metric H adapted to the approximation of this image. 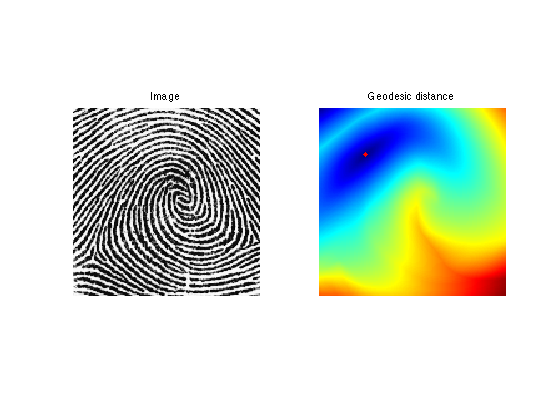 Exercice 4: (check the solution) Perform farthest point sampling. Exercice 5: (check the solution) Compute the geodesic Delaunay triangulation of this set of point. 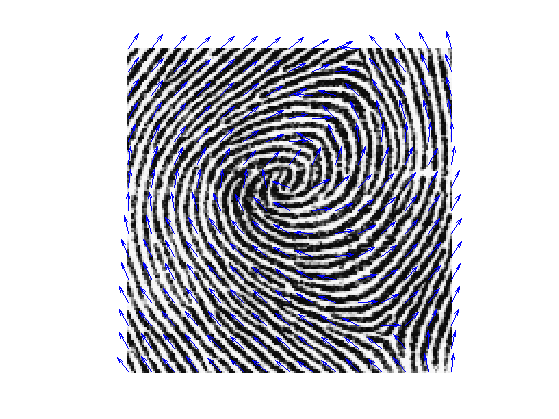 Exercice 6: (check the solution) Perform image approximation using linear splines.